Make potatoes as directed on box. 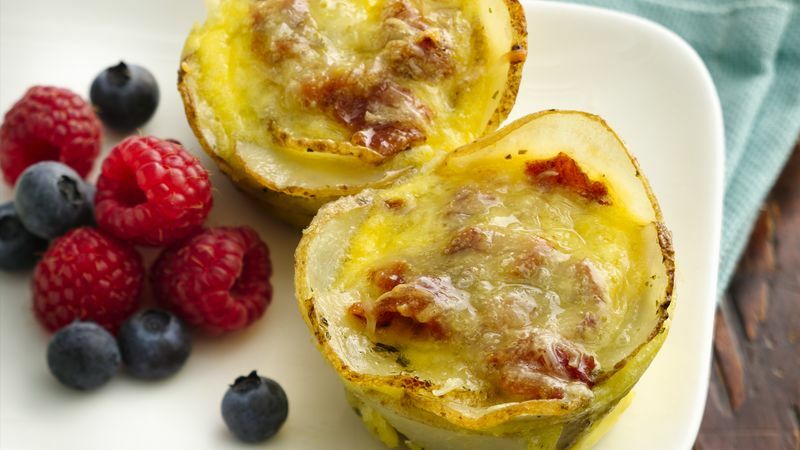 Divide potato mixture evenly among muffin cups, pressing in bottom and up side of each cup to form crust. Sprinkle bacon and cheese evenly in cups. In medium bowl, beat eggs and cream. Pour filling evenly in cups, about 1/4 cup each. Bake 25 to 30 minutes or until knife inserted in center comes out clean. Let stand 10 minutes before serving. Want veggies instead of bacon? Try substituting 1/4 cup cooked spinach, drained, for a delicious variation. Try a variation on this delicious quiche by substituting your favorite fillings, such as ham and cheddar cheese. It will be just as delicious!